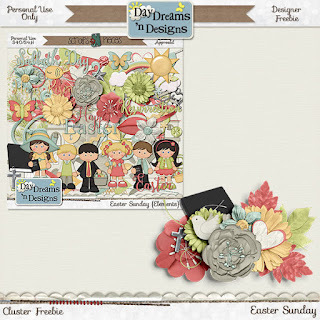 Great new kit available by Day Dreams 'N Designs, Easter Sunday! This kit is perfect for Easter but with all of the elements in it, it could be used for just about any occasion. Here is what I did with the kit, I love the colors! Lastly, I have a link to a freebie for you, from Day Dreams 'n Designs. Click the preview or click here to be taken to her blog. Sign up to her newsletter for more freebies and the latest news! And this is a free cluster from me. You can click here or the image to download.